Rooms can now be reordered on the website under My School > Rooms. All changes will reflect on the app on the Filter screen, the Rooms screen (under Admin Tools), and the Live Room Status screen. Updates have also been made to the "Send Parent Invite" and "Print Parent Invite" links (see below for screenshot). 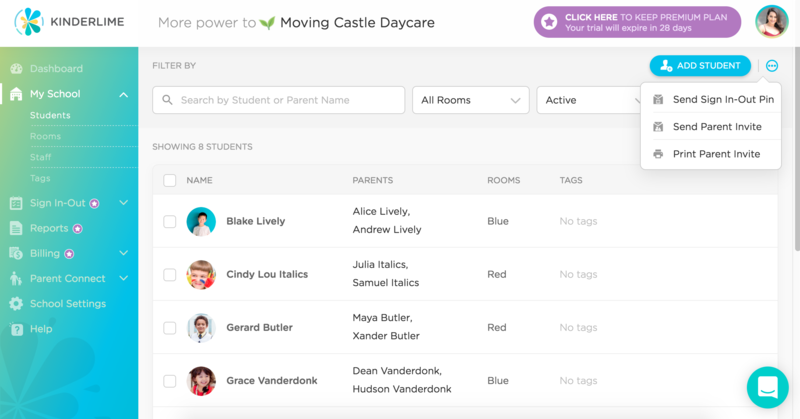 When selecting "Send Parent Invites," only parents/guardians who have not yet signed up for a Kinderlime account will receive an email inviting them to do so. This email will include links for downloading the app, instructions on how to sign up, and the 6-character code for adding their child(ren). When selecting "Print Parent Invites," you'll be able to print or save a PDF file with invitations for families who have not yet signed up for an account. Each invitation is one page long, and includes instructions on how to sign up for the Kinderlime app, the 6-character code for adding their child(ren), and further tips on what to do after successfully signing up.